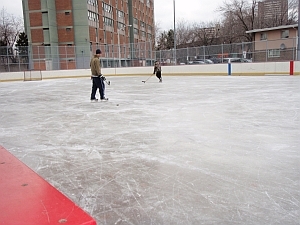 Regent South Rink was open with a building attendant and a rink guard. Good ice, four people playing shinny hockey. The sign was from last year's closing date. The rink house was light-filled and run-down and friendly as always. At 5.40 there were eight skaters on the ice and another 5-6 kids inside the rink house. Regent South is always a fun place to start a conversation -- people (usually kids) are polite and they always have interesting things to tell. There was some difference of opinion about when the flying squad comes, but most kids felt it comes twice a day, either at 2 and 6 or at 12 and 4. The ice on Friday was good. The building attendant, whose little brother was also there, said they had a permit last year but this year "nobody wanted one." 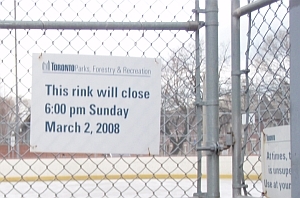 If the ice is bad, they don't use shovels, since their long green scrapers got broken. They were never fixed. One of the kids was retaping his stick. They said they can buy hockey tape at the variety store across the street, the Daisy Mart, which stocks it along with groceries. I asked the kids if they wanted a photo on the web site and at first they said they wanted an action shot, but then they changed their minds. They said I should write that the Regent kids are shy -- but talented.